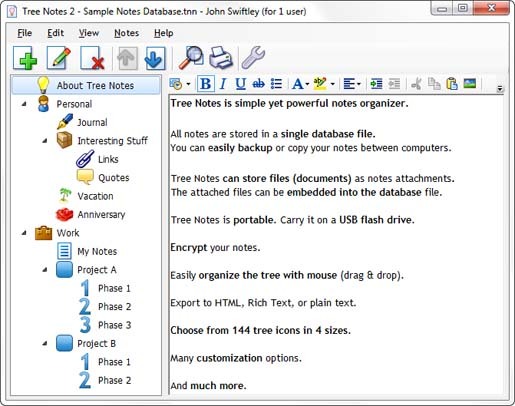 In order to organize your notes and make them simple-to-use, you can use Tree Notes. It is a simple tool but, brings the powerful capabilities for keeping your notes organized in a hierarchical tree with icons. With this tool, you can choose from more than 144 colorful icons in 4 sizes for your notes in the tree. This reliable notes organizer is useful to export to plain text, rich text, and HTML. Moreover, with this tool, you can have the features such as easy activation system-wide hotkey, option to print all notes or just the notes you want, easily search all your notes, undo option, easily cut, copy and paste your notes; Rich text formatting, insert images; easy backups, it can be run from a USB thumb-drive, customizable interface etc.